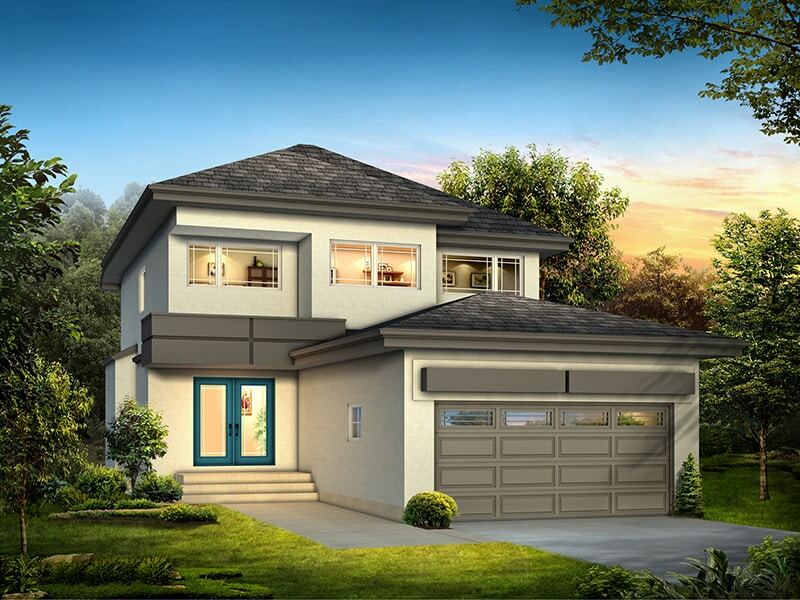 The Ridgebury II is an A&S Homes 2 storey classic. This 4 bedroom, 2 1/2 bath design is perfect for entertaining with its open concept layout, built-in entertainment centre, stone surround fireplace, private formal dining room and lower level bar and media centre. The home features hardwood and ceramic tiled flooring, a maple glass paneled staircase and a front foyer glass dining room dividing wall. The executive chefs kitchen has maple cabinetry, granite countertops, a customized enlarged island with raised bar, tiled backsplash detailing and an eating area for informal dining. The master suite has an enlarged walk-in closet, a deluxe ensuite with a 6′ drop-in tiled jetted tub and a stand-alone 4ft custom frameless glass shower. The exterior of the house shines with a contemporary wood panel design, an abundance of oversized windows, a grand front entrance with double glass doors and an oversized double attached garage.